The 2013 America the Beautiful 5 Ounce Silver Bullion Coins mark the fourth year for the US Mint’s America the Beautiful Silver Bullion Coin™ Program. Coins in this series are struck for investors from five ounces of .999 fine silver to a diameter of three inches. This series was authorized by Congress along with the circulating America the Beautiful Quarters® Program with the passage of Public Law 110-456 (America’s Beautiful National Parks Quarter Dollar Coin Act of 2008). Both series of strikes feature similar reverse designs emblematic of sites of national interest from around the United States and its territories. One site for the programs was chosen from each state along with the District of Columbia and the five territories of the United States for a total of fifty-six locations to be honored. Both programs debuted in 2010 and have five strikes scheduled annually to be released as part of them until the final strike appears in 2021. Both programs can be extended, however, for another complete run if the Treasury Secretary makes that determination and informs Congress of such in the time allotted by the authorizing Act. 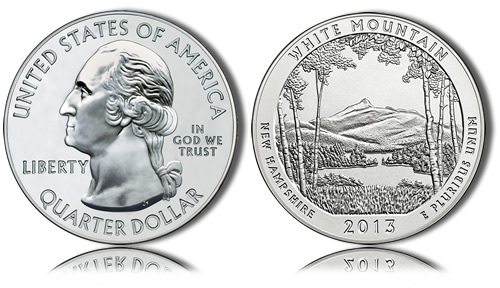 The White Mountain Silver Coin was released by the United States Mint to honor White Mountain National Forest located in the state of New Hampshire. When issued, it appeared as the first 2013-dated strike in the series but also marked the sixteenth in the program overall. White Mountain National Forest was officially established in 1918 following several years of land acquisition by the federal government. The forest encompasses a total of 784,505 acres spread across three discontinuous sections with a small part of the forest stretching into the neighboring state of Maine. 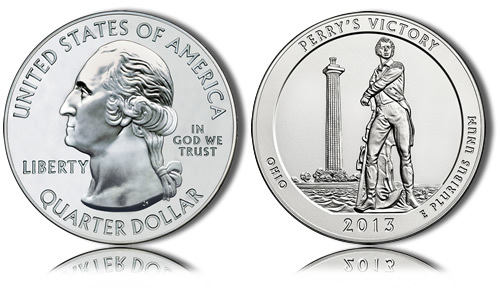 The Perry’s Victory Silver Coin honors Perry’s Victory and International Peace Memorial found in the state of Ohio. The coin features a reverse design emblematic of that location and an obverse containing a portrait of George Washington, the first President of the United States (this same portrait appears on all of the America the Beautiful related coins and first appeared on the 1932 circulating quarter dollar as designed by John Flanagan). A multi-state commission started construction on the memorial in 1912 and it was handed over to the federal government in 1919 with a formal dedication occurring in 1931. The site commemorates the victory of Commodore Oliver Hazard Perry over British naval forces during the War of 1812 and the lasting peace that has endured between the United States, Canada and Great Britain ever since. 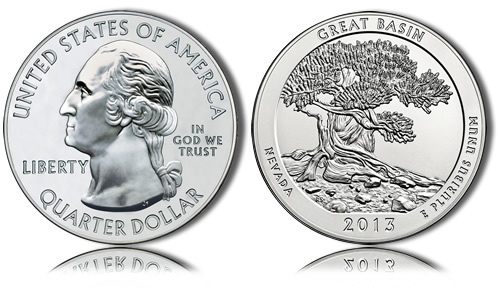 Released as the third 2013-dated strike of the series was the Great Basin Silver Coins. These strikes honor Great Basin National Park of Nevada with a reverse design emblematic of the park. The park was only established on October 27, 1986, but a section came under the control of the federal government in 1922 when Lehman Caves National Monument was created. The park is located approximately 4.5 hours north of Las Vegas and is considered one of the best locations for nighttime sky viewing as very little light pollution is present. 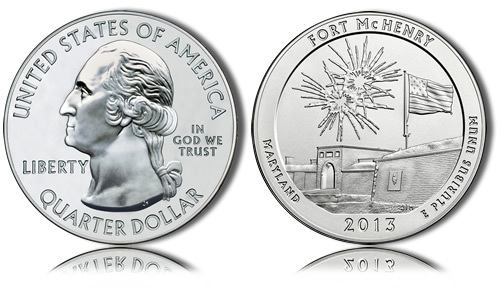 The Fort McHenry Silver Coins was released as the fourth 2013-dated strike in the America the Beautiful Silver Bullion Coin Program and honors Fort McHenry National Monument and Historic Shrine of Maryland with a reverse design showcasing a portion of the monument. The obverse contains the aforementioned portrait of George Washington as seen on all of the America the Beautiful coins. Fort McHenry National Monument and Historic Shrine was originally created on March 3, 1925, but preserves the fort which dates back to right after the American Revolutionary War. The fort became famous during the War of 1812 when it survived British naval bombardment and inspired Francis Scott Key to write "The Star-Spangled Banner" poem which later became the national anthem of the United States. 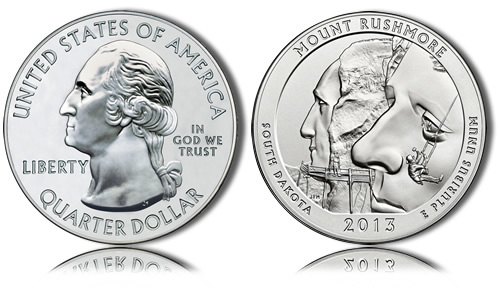 Issued as the last of five 2013-dated strikes in the America the Beautiful Silver Bullion Coin Program is the Mount Rushmore Silver Coins honoring Mount Rushmore National Monument of South Dakota. These strikes also mark the twentieth in the series overall which debuted in 2010 and will see a total of fifty-six before it is completed in 2021. Mount Rushmore National Monument was first established on March 3, 1925 with construction beginning under the watchful eye of sculptor Gutzon Borglum in 1927. Construction ended in 1941 with the likeness of four former Presidents of the United States sculpted into the mountain. Presidents George Washington, Thomas Jefferson, Abraham Lincoln and Theodore Roosevelt are all represented by 60-foot sculptures of their heads. Additional information on this series of coins can be found on a site dedicated to the program by clicking on 5 oz bullion coins. These America the Beautiful 5 oz Silver Bullion Coins will be issued at a rate of five per year until fifty-six have been released with the final scheduled to appear in 2021. The coins are not sold directly to the public by the US Mint, but instead are sold through the Mint’s network of authorized purchasers which the Mint typically uses for all of its bullion products. This network obtains the coins in bulk from the Mint, then resells them for a small premium above the current spot price of the precious metals contained within them to coin dealers and the public.